It’s still not December yet and Christmas decorations can be seen everywhere you go here. I am also preparing for Christmas and more especially for a Christmas market I’m going to participate in. So, a am in full preparation for this witch means that I’m spending a lot of time doing clay crafts. I will sell both Christmas ornaments and things for all the year around. I will of course show you the crafts later, but until then I can show you one type of ornament I will bring with me to the market. In this post I thought that I could show a crochet project that I finished up some week ago.I crocheted a hat in grey yarn, without a pattern. I just choose two different stitches that I had seen on the internet and put them together. The stich I’ve used for the whole hat is called coat stitch and for the bottom part it’s some type of ribbing. It took me quite some time from start to finish because the coat stitch, according to me is tricky. Since I didn’t have a pattern I had to see and feel when it felt right to decrease the stitches and finish up the hat. I am pleased with the results of this project. When I’ve made hats in the past they’ve usually become to small but I intentionally made this one a lot bigger and it worked this time. I think it’s more fun to assemble your own pattern than to use a ready one, but of course it’s more of a challenge. I wih you had a nice time and I hope you all have a good afternoon, evening, night, morning or day wherever you may be on this planet. So, this is my first blog post this year, the new year 2017. I believe I wrote on Christmas eve that I would soon show you all some of my handmade Christmas gifts and I should think that it’s about time that I do it now. Therefore, will this post be about handmade gifts that I already have given away because now Christmas is more or less over. 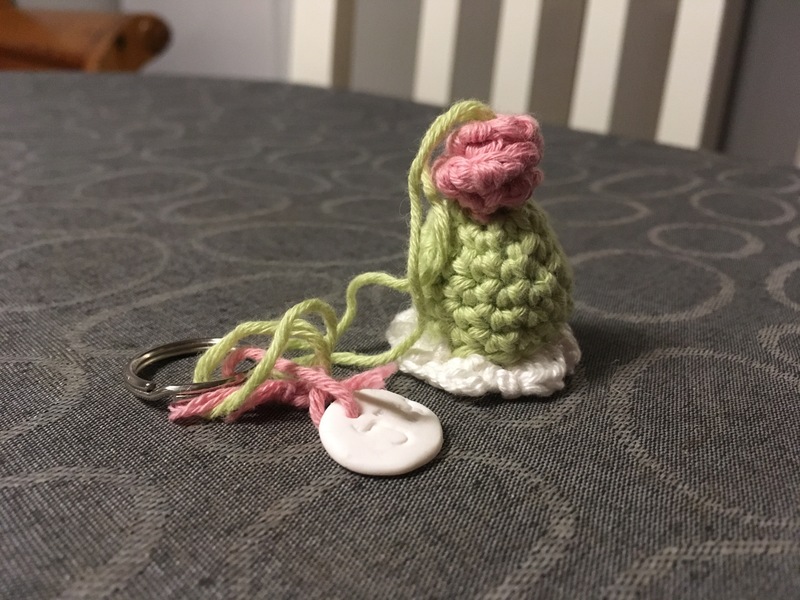 I crocheted this flower bookmark for my grandmother because she absolutely loves to read and she has almost always more than one book at a time. That’s why I thought I would be appropriate to give her a handmade bookmark so she can keep track on what page she is on when she switches between books. I also made a hat for my mom in crochet but I sadly do not have a photo of it yet, but I will see if I can get a picture of it. These clay charms were made for two of my friends. I like to have a story behind the things that I create. I don’t want the gifts to be random I want them to have a personal meaning for the receiver of the gift, of course I can only accomplish that if I know the person though. One of my friends she is studying to become a dentist and therefore I made a tooth and a toothbrush out of FIMO clay for her. Then I attached the two charms together and contacted them to a blue ribbon so it would function as a necklace. The waffle with the strawberry is for another friend and she really likes waffles and so I thought I have to make her a waffle that she can walk around with all the time. 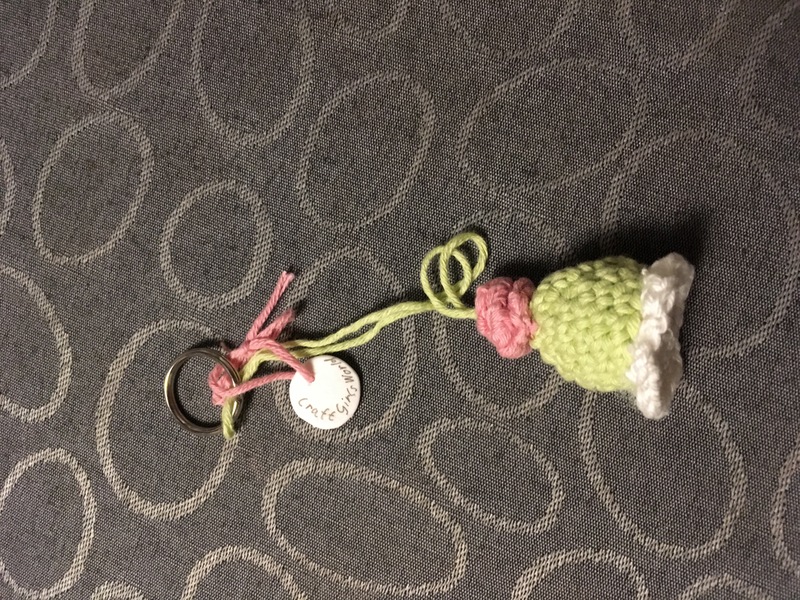 Some projects I’m working on right now are some more of the Swedish princess cake keychains and clay frames. I have also tried to follow World Watercolor Group’s art challenge this month so I thought that I will post the first week’s drawings tomorrow. I hope you all had a lovely time in this post and on my blog. I wish you all a good evening, night, morning, afternoon or day wherever you may be on this earth. Hi there once again! Today it seems like I will publish two posts. These gifts have already been given so I thought I would let you all see it. 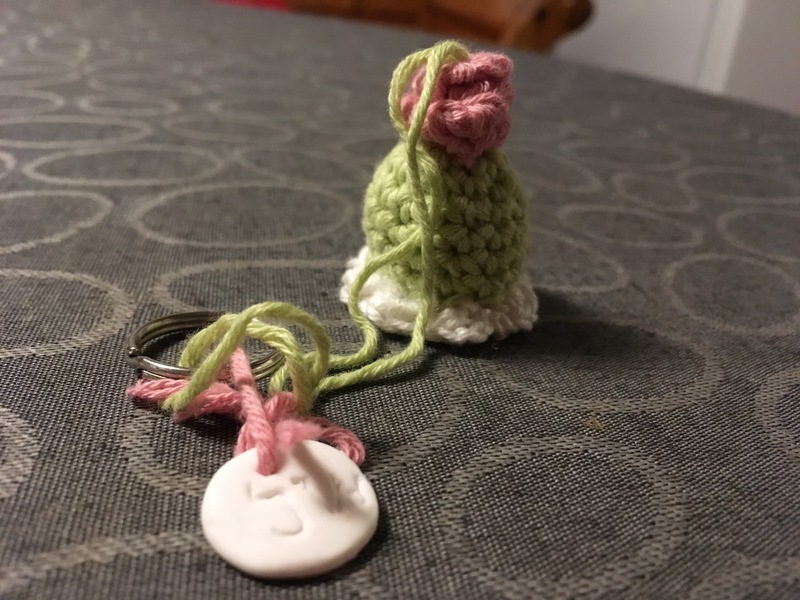 So I made small swedish princess cakes out of crochet and then I connected them to keychain rings. I later attatched, to the keychain, small handmade Fimo Clay charms with my initials and the namn of my website. Then I printed a gift box template from Pinterest and cut out the box. I used double-sided tape to put the box together and some string for decoration. 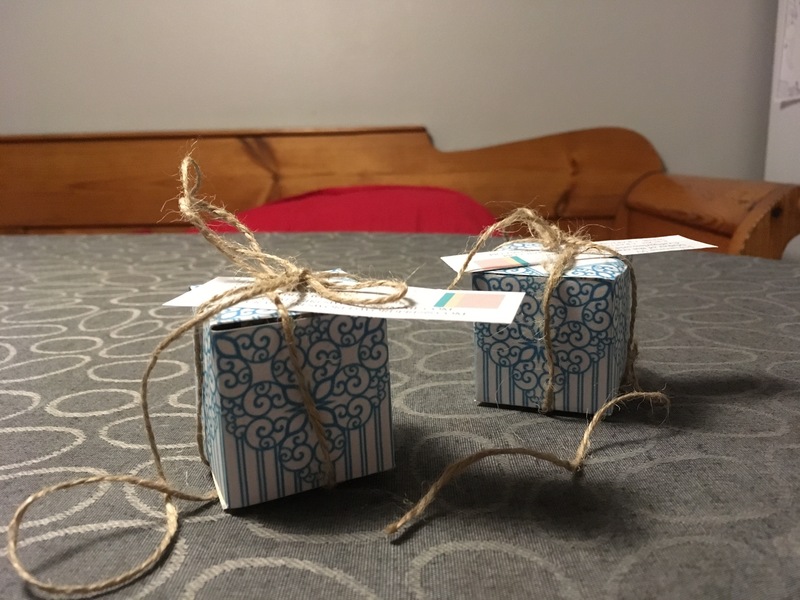 I created these gifts for my boyfriends teachers as a Christmas gift. I wish you all once again a great holiday and a good afternoon, evening, night, morning or day wherever you may be on this earth. Hello again, and yes I’m back so soon with an old craft. I see myself as a crafter with few limits or at least I try to broaden my view in the craft world as much as I can. Today I would like to share with you another type of craft that I make and that’s crochet. I rather much prefer crochet over knitting but that is of course only my opinion. When I was a child I always tried to knit a scarf every Christmas but I never came too far with that, so I never got to enjoy knitting. 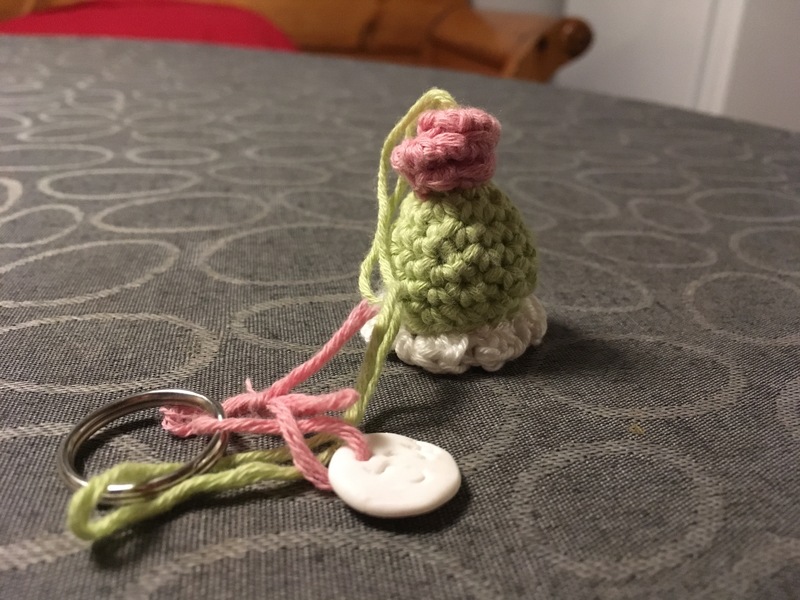 When I told this story, someone said ‘’ why don’t you try crochet, it’s so much fun’’ and so I did and I’ve been doing it ever since. I’m such a person that can make many crochet projects after another and then it can take months before I start again. But I usually always make a crochet Christmas gift, at least one every year. I think that things made from yarn are very suiting for the holiday season. I am happy to say that I one year managed to crochet a whole scarf. Last December I crocheted my most complicated project yet, I made small baby converse for an acquaintance that expected her second child. She loves converse and that’s why I decided to create small soft baby converse. I found many free tutorials on how to crochet baby converse shoes on YouTube. So, I watched different of them and I think that I mixed some of the videos to get the shoe as I wanted. If you are interested of doing something similar I recommend looking at YouTube. I don’t remember how much yarn I used for this project but it wasn’t too much. I can at least say that an autumn scarf needs more yarn than these two small shoes. I hope that you had a nice time in this post with old crafts.